I'm getting ready to record my new CD and my new DVD, The Wedding AlBUM! To help make the The Wedding AlBUM possible, I set up a Kickstarter project. WHAT IS A KICKSTARTER PROJECT? Kickstarter is a type of crowdfunding. Essentially, somebody like me decides to do something creative, like write a book, make a movie, build something, or make their comedy album. Friends, family, and fans decide they want to help make that project possible by backing the project financially. In exchange, they receive gratitude and rewards (such as the final product, aka Comedian Jake Sharon's The Wedding AlBUM) and other cool stuff. WHY DOES The Wedding AlBUM NEED A KICKSTARTER? I set up a Kickstarter project to help pay for the production crew, the editing, all the CDs and DVDs. There are a lot of expenses. Sure, I can make a low budget-version of The Wedding AlBUM. But together, we can make The Wedding AlBUM the best it can be! for the upcoming The Wedding AlBUM CD/DVD recording! Click on the big green button that says "Back This Project." Choose your contribution/ reward level. Kickstarter and Amazon will guide you the rest of the way! Even $1 will help! Whatever you can do. I'm just glad to have you involved! WHAT HAPPENS IF WE DON'T REACH OUR FUNDING GOAL? You don't get charged anything. I'll still make The Wedding AlBUM- but it won't be as special as it would be with your help. For example, here's one version of what my comedy dvd would look like if I can't afford to hire a proper production crew. Note: because this is a crude production, there is some crude language. WHAT HAPPENS IF WE DO REACH OUR FUNDING GOAL? If do meet our funding goal, your contribution goes directly to the project and The Wedding AlBUM gets to be the best it can be! You can take pride in helping produce a really fun project. It takes teamwork and we're all going to be in this together! Exciting! The Wedding AlBUM CD/DVD Recording March 28-29 in Austin, TX! Plus, besides my undying gratitude, you'll receive all kinds of rewards, aka "wedding gifts." 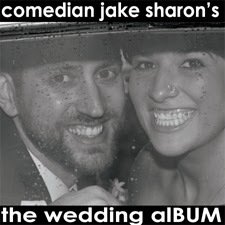 One wedding gift you can get is The Wedding AlBUM itself- the CD & the DVD!!! I am really proud of the content that is going to be on The Wedding AlBUM. I have been honing it since my previous CD, JAke's First Purge. JAke's First Purge was well received by critics and fans alike. I am proud to say The Wedding AlBUM will be even better! You're going to get my best material to date! You can get a lot of great wedding presents. Depending on your contribution level, you can get digital downloads, my original art, part of the set, and a whole bunch of other cool stuff that is conveniently listed on The Wedding AlBUM Kickstarter page. Just choose your level of contribution and you'll be rewarded by the appropriate wedding presents! GOT ANY OTHER QUESTIONS? ASK ME! These are all the questions I can think of that people have asked me. But, please feel free to contact me about whatever- even if it has nothing to do with The Wedding AlBUM! I like questions! I really appreciate you. I appreciate you taking the time to read this and I appreciate you being in my life.